Open Street events create miles of safe, car-free streets so that residents of all ages can walk, bike, participate in spontaneous play activities, and get to know one another. Event is free and open to the public. You will gain the tools, knowledge and connections for developing exceptional affordable homes that support broader opportunities for low-income families. Please email or call 1-800-321-5011 with questions. The Twin Cities’ Roots, Rock and Deep Blues Festival, sponsored by the City of MinneapolisGreat Streets Program, is back with more than 25 bands and 6 stages this year. Lake Street has been home to generations of new immigrants from the 19th Century through today. Take a closer look at the small businesses and cultural organizations they established in their pursuit of the American Dream. Saturday: West Broadway from the Mississippi River to Penn Avenue and on North 2nd Street from 16th to the 24th Streets. This fair is free and open to the public. Email Ayianna Kennerly or call 612-490-2222with questions. Four Sisters Farmers Market is an Indigenous-centered food market, focused on both Indigenous and hyper-local foods from Phillips and surrounding neighborhoods. On June 5th, Minneapolis City Council approved the sale of growlers on Sundays and is one of the first cities in the state to approve Sunday growler sales, which city leaders say will support the burgeoning craft brewing industry. Starting June 14, brewpubs and taprooms can begin selling the 64-ounce refillable jugs of beer on Sundays. The measure, which passed 13-0, also allows restaurants to serve bloody marys and other drinks starting at 8 a.m., rather than 10 a.m., on Sundays. The Minneapolis Planning Commission will consider designating “Innovation Districts” to boost development. Council Member Cam Gordon has proposed two resolutions tied to the idea, including designating a section of Southeast Minneapolis near the University of Minnesota as the first such district. A City Council committee voted to update the city’s rules for stores that sell used goods,lowering some licensing fees and doing away with some restrictions that had lumped many types of businesses in with pawn shops. Other changes include updated rules for the types of purchases and sales store owners must report to the city. About 20 distilleries are either open now in Minnesota or expect to launch within a year. The May 2015 Minneapolis unemployment rate dropped .1% from April to 3.5%, resulting in just over 8,100 residents unemployed and actively seeking employment. The federal government’s estimate of the Minneapolis labor force continues to rise, up to 232,785 – adding over 6,000 residents to the labor force since January. The year-over-year trend for May shows both increased labor force participation (adding nearly 4,000 to the labor force) and lower unemployment by .2%, both indicating confidence in the local and regional economy. Although it placed sixth in 2014, Minnesota has moved to the top spot this year as “America’s Top State for Business” from CNBC. CNBC’s annual study ranks all 50 states on 60 measures of competiveness, separated into ten categories. Minnesota received the highest overall score this year across the ten categories, including the economy due to Minnesota’s low unemployment rate of 3.8 percent. Since 2011, Minnesota’s growing number of businesses has added nearly 189,000 jobs. The highly educated workforce earned Minnesota second place in education, and the low crime rate, clean air and water, and access to quality health care, made Minnesota third in the quality of life category. 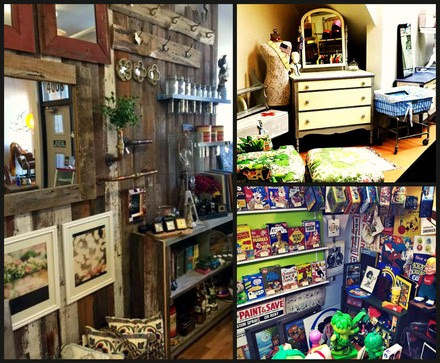 Located between 32nd and 41st streets in the Longfellow neighborhood, the Minnehaha Mile is a shopping district consisting of eight stores all with a vintage, re-use, and upcycle theme. The stores are: Junket Tossed & Found,The Natural Built Home Store, Time Bomb Vintage, Family Estate Sales,Turquoise Vintage, E’s Emporium, and Plum Crabby. The mile wasn’t always lined with unique and creative businesses selling items ranging from vintage clothing to antique furniture, to collectables, to hand made gifts designed using locally sourced items. Prior to 2012, a zoning ordinance prohibited secondhand goods stores from being within 1000 feet of each other. City staff worked with Council Member Glidden’s office to lift the restrictions and make it easier for secondhand stores to operate. Once the ordinance was amended, new life was brought to once vacant storefronts. Now that the shops could co-locate, it was time to work on a unifying branding strategy. With the help of Seward Redesign and the Longfellow Business Association, the shops were awarded a City of Minneapolis Great streets grant in 2014 to launch their official identity and the campaign “Shop the Minnehaha Mile” was launched including a printed guide map andFacebook Page. This year, faced with construction along Minnehaha Avenue from Minnehaha Parkway to 38th Street, the Milers sought a second Great Streets grant to further raise the visibility of the emerging vintage district and to remind customers that businesses are open during the construction. They also worked with City staff to draft code amendments that dramatically reduced the regulations and fees for these types of businesses. Ultimately, Milers say that their goal is to help customers find what they are looking for and have a great experience while doing it and, together, they can accomplish this much better than on their own. This month The American Institute of Architects – Minneapolis Chapter gaveCityDeskStudio a Merit Award for their renovations on the Longfellow restaurant, Peppers & Fries Burger & Burrito Grill. The Merit Award honors projects that tell a compelling story and benefit its users’ lives. Once an abandoned Super America gas station overrun by graffiti, squatters, overgrown vegetation, and trash, Peppers & Fries has now become a family friendly neighborhood hot-spot. The restaurant received funding from the City of Minneapolis’ Great Streets program, which helped turn the vacant lot into an award-winning architectural project and vibrant space. It also supports the commercial revitalization of the east end of Lake Street, satisfying the need for a new neighborhood restaurant. Architect Ben Awes stated that CityDeskStudio’s approach to creating the new Peppers and Fries was to “fit in and stand out,” using existing materials such as reclaimed wood for the tables and bar tops and finishing the concrete floors. 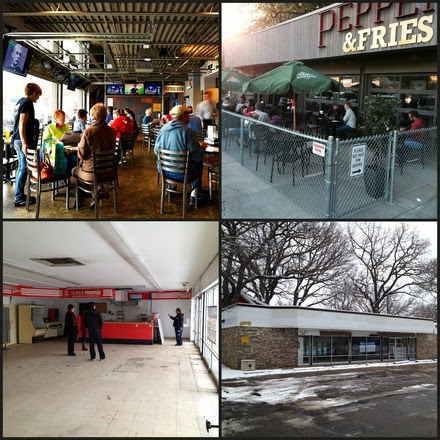 By staying true to the building’s original structures, Peppers & Fries is now a unique and positive addition to the Longfellow neighborhood. Woodchuck USA is a USA-made brand that manufactures real-wood products with a mission to “bring nature back to people” and jobs to the United States. Founded by Benjamin VandenWymelenberg as an architecture student at the University of Minnesota (and originally only making iPhone cases), Woodchuck has grown tremendously. The company now offers a diverse range of products, from laptop cases to journals to flasks, and services such as corporate gifting to clientele both nationally and internationally. This spring, Woodchuck was awarded the Breakout Business of the Year by the Minneapolis Regional Chamber of Commerce. A small, young company of 17 full-time employees, the Woodchuck team relies on its ability to push boundaries in order to complete any task handed to them regardless of the scale or time-frame. After receiving support from the City’s Two Percent Loan Program, the company was able to purchase a large, high-powered laser cutter, allowing them to explore new markets (such as commercial interiors and large wooden art) and triple its capacity to keep up with rising demand for Woodchuck products. Woodchuck’s immense growth since its start is reflected by their developments in products and clients. 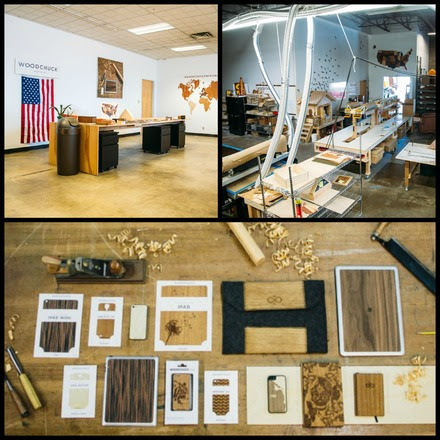 A company that once sold iPhone cases in Saran-wrapped packaging now distributes a variety of high-end wooden products to clients including Fulton Brewery, Cambria, Sun Country Airlines, and the Minnesota Vikings. July 19th marks the beginning of the Made Here Market, a series of pop-up markets (taking place as part of the Loring Alley Rally) featuring locally made fine art and goods. The market, hosted in collaboration with the Third Bird Restaurant, runs each Sunday from 11 a.m. to 6 p.m. until August 30th and is located in the Loring Corners alley. Funded in part by the City of Minneapolis Great Streets program as a way to generate activity to the alley, the Made Here Market is expected to bring thousands of visitors to the market in addition to live music, food and drinks. At the market, visitors can find artists working in all mediums, vintage sellers, and textile and craft supplies vendors. Made Here Market vendors can exhibit their work for up to three weeks, making each Sunday unique with new artists, food and music. Launched in 2013, Made Here is a Hennepin Theatre Trust initiative to bring more people to the downtown Minneapolis Cultural District. It brings art to public spaces in ways like pop-up parks, live performances and rotating exhibitions. 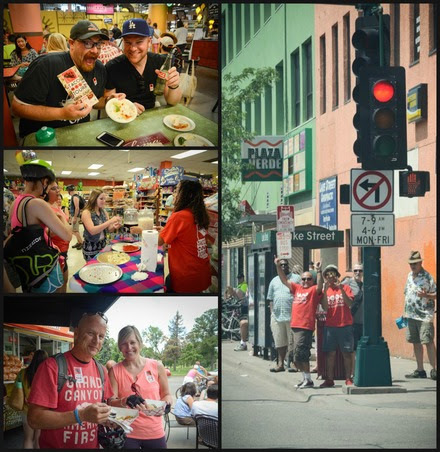 Thank you to everyone who attended the 2nd Annual Lake Street Taco Tour! More than 2,000 attended the tour on Saturday, July 27th. The tour was produced by the Latino Economic Development Center (LEDC) and supported by the City of Minneapolis Great Streets program to raise awareness and promote the diverse business community located within the East Lake Street Corridor. The event featured nine authentic Mexican restaurants that offered their versions of delicious tacos.